Welcome friends, to the best of Tex-Mex fusion. It's a hearty mix of Mexican spice along with some strong American flavor. 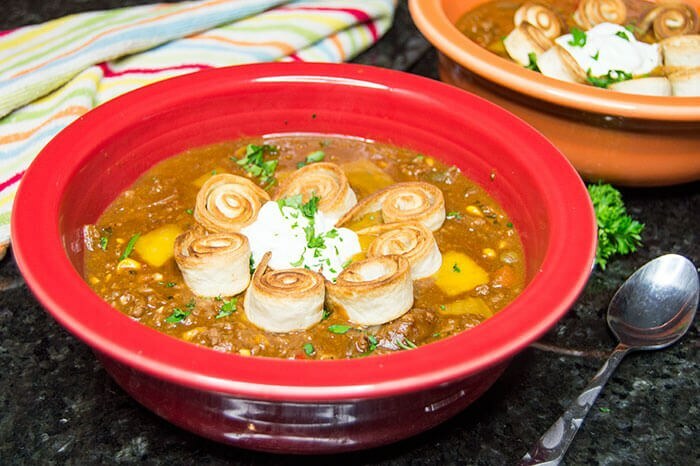 After a gloomy day of grey skies and snowy winds, this chili will certainly thaw you out of your misery. 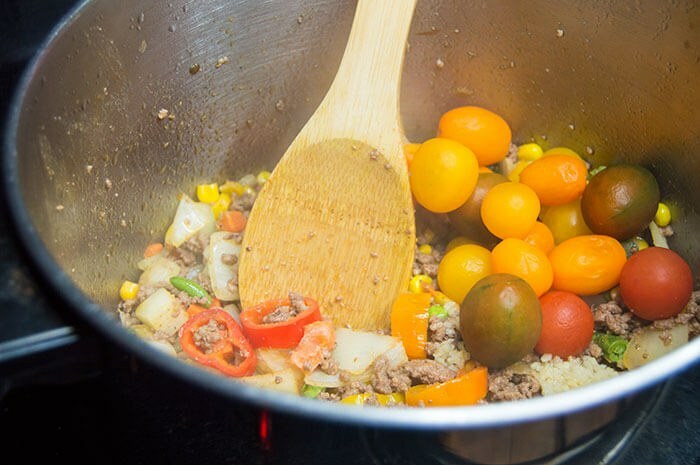 To start, you'll want to grab a large sauce pan to brown the ground beef. I used an extra lean ground beef and rinsed it in warm water once it was cooked through, to help remove the excess fat. I also used a combination of frozen and fresh vegetables, including frozen corn, peas, and green beans alongside fresh sweet peppers, onions, cherry tomatoes and garlic. My local grocery store had a box of cherry tomatoes that were mixed in color from red to purple - so naturally I tossed those in for an extra burst of color. Of course, the key to the perfect chili to melt away the winter blues is the heat. Seriously, some sinus clearing hot sauce can really do a person wonders. 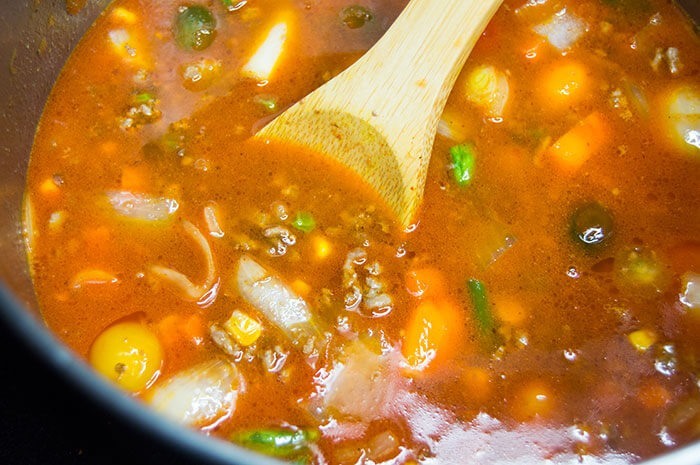 This chili is pumped up to the max with an atomic hot sauce that will blow away your taste buds. 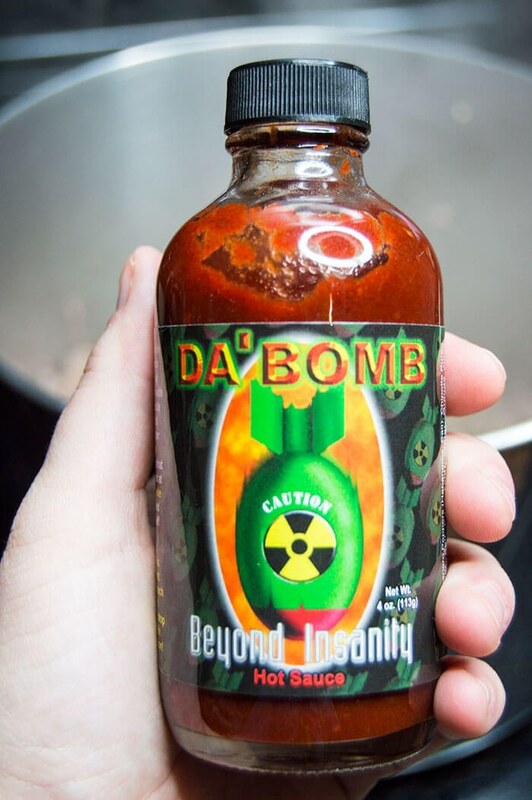 As one of the hottest hot sauces you can buy, this sauce is literally beyond insane. I used just one drop in my chili and could feel the heat rush to my face on the very first bite. Feel free to use your favorite hot sauce and adjust the heat to what you can personally handle. My boyfriend and I LOVE all things spicy - he has eaten this sauce raw on more than one occasion (ouch!). 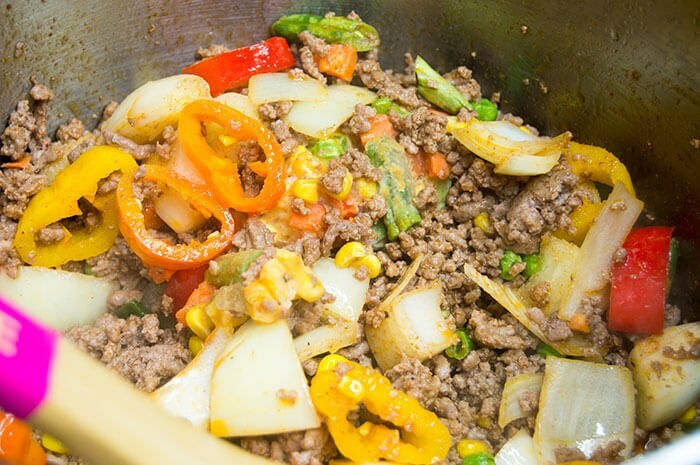 Stir the hot sauce into the beef as you pour in the salsa and beef stock. I used a mild tomatillo and garlic salsa in mine, since I was already using the hot sauce to pump up the heat. But there's another secret ingredient in this chili: cocoa powder. 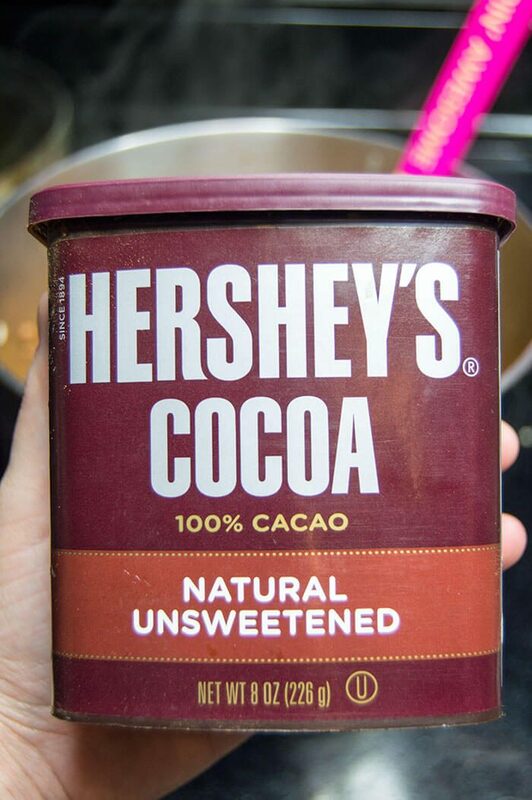 That's right - cocoa powder adds a rich savoriness to the chili to help balance out the spiciness. At this point, the chili will be pretty liquidy, but no worries - refried beans are here to save the day! Yes you read that right: refried beans! 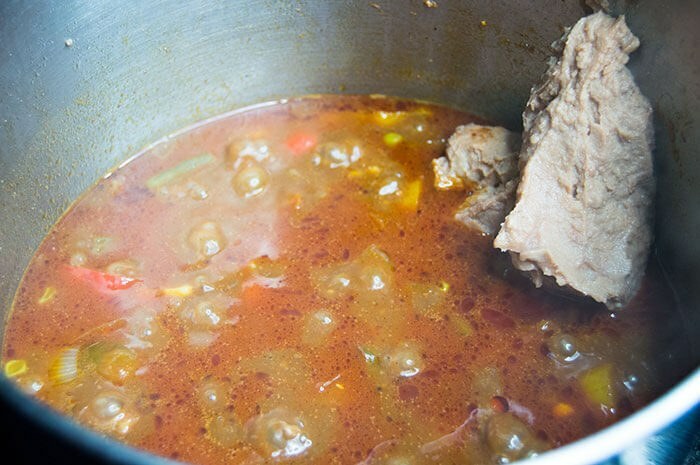 They help to naturally thicken the chili as it cooks, while adding a heaping helping of protein. At this point, just cover the chili and let it simmer for a while, checking in the stir occasionally. 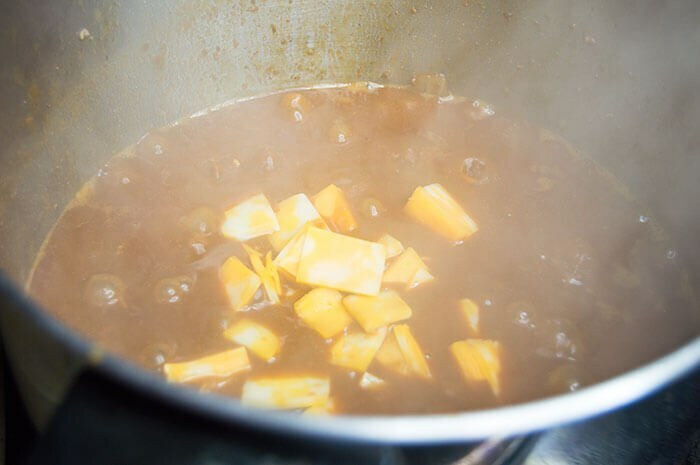 Once the chili reaches your desired consistency, add half of the cheese cubes to melt in the chili. 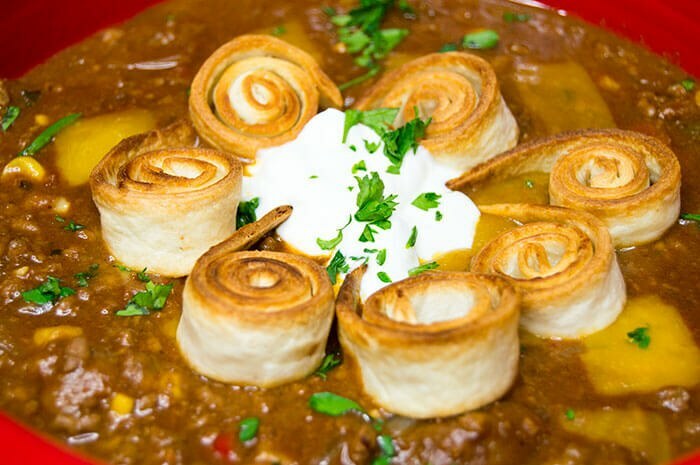 Cheese is what really helps make this chili truly Tex- Mex, because as we all know, Americans love cheese! I also cut some tortillas into strips, spiraled them up, spritzed them down with cooking oil, then baked until they started turning golden brown. The spiraling part is optional - but definitely a topping worth adding. 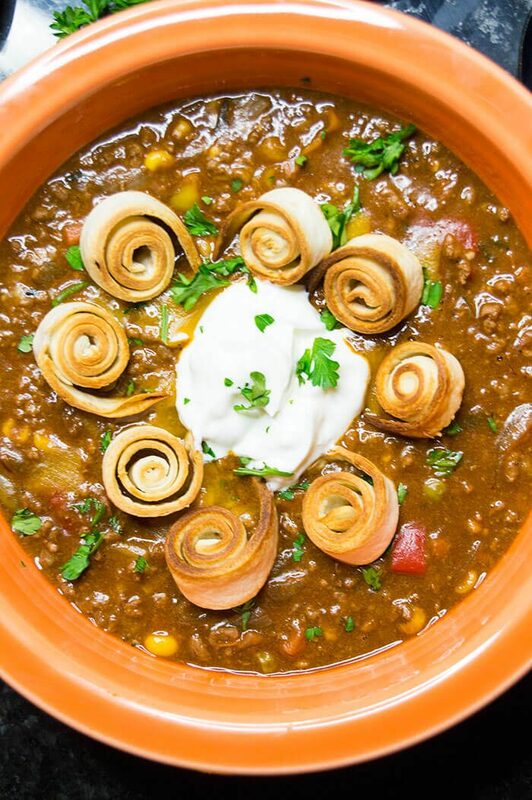 We ate our chili garnished with sour cream and fresh cilantro, and ended up using tortilla chips instead of spoons to enjoy it! In a large pot over high heat, cook and crumble the ground beef until it is no longer pink. Rinse the beef in a strainer under warm water and return to the pot. Reduce the heat to medium high. Add the frozen vegetables and cook until mostly thawed. Stir in the onion, garlic and sweet peppers. Cook until tender, stirring occasionally. Toss the cherry tomatoes, whole, into the pot. Season with cumin, coriander, and chili powder and stir until the tomatoes have softened and begun to lose their juices. If using, add a tiny dab of hot sauce. Stir the hot sauce into the beef along with the mild salsa. Pour in the beef broth and bring to a rolling boil. Add the refried beans to the chili and reduce the heat to medium low. Simmer, covered, for forty five minutes to an hour, or until the chili has thickened. Uncover and let cook for an additional fifteen minutes on low heat. OPTIONAL: Cut the tortillas into long, thin strips. Spray lightly with cooking oil then roll into coils (if you so please, this is also optional!). Preheat the oven while the chili cooks to 375 F. Place the rolled tortillas onto a baking sheet greased with cooking spray and cook until crisp and golden - about 3-5 minutes. Serve alongside tortilla chips, cheddar cheese and sour cream and garnish with fresh cilantro and a squeeze of lime.